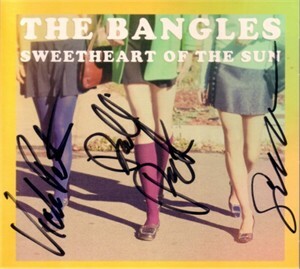 Brand new Sweetheart of the Sun CD by The Bangles autographed on the cover in black marker by Susanna Hoffs, Debbi Peterson and Vicki Peterson. PERFECT MINT condition. Obtained in person at limited signing, with certificate of authenticity from AutographsForSale.com AND photo from the signing. Signatures may vary slightly as we obtained multiple CDs at this signing.